O’Dwyer’s desire for a bigger family and more quality time with her young children reflects, in some respects, the challenges ordinary working mothers in Australia face every day. It also highlights yet another example of the difficulties faced by women in politics. As Liberal senator Linda Reynolds wrote in an opinion piece: O’Dwyer’s resignation “is not simply a gender issue. It is a parent issue”. But for every Tim Hammond (the federal Labor Member for Perth who quit politics last year for family reasons) there is a Kelly O’Dwyer or a Kate Ellis. However, like all flexible working arrangements, job sharing cannot be seen as a solution or alternative for women alone—swapping the political sphere for the private. Male politicians with children would need to be encouraged to adopt these arrangements should they ever eventuate. And getting men to take up flexible working arrangements is not always successful as evidenced by policymakers’ attempts to get new dads to take up parental leave. Like ordinary working women, female politicians need not only supportive workplaces but supportive families. Former Queensland premier Anna Bligh relied on her partner and mother for support during her time in office. 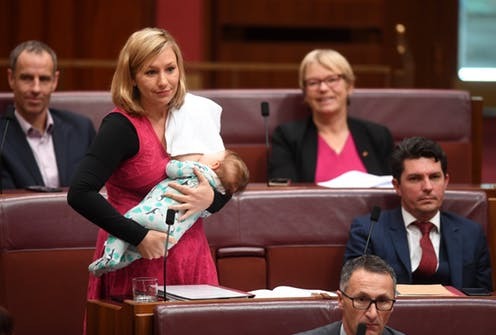 However, not every female politician has a Greg Withers or a Clarke Gayford, partner of New Zealand prime minster Jacinda Ardern, to care for their children while their partner gives a speech to the United Nations. Jacinda Ardern provides one example of greater flexibility for mothers who are parliamentarians. She has broken up her schedule into three-hour slots so she can breastfeed. But not every woman in parliament has as much control over her schedule as a prime minister. In Europe, things are also progressive with women politicians in the European Parliament—including most famously Italian MEP Licia Ronzulli—taking their children to parliamentary debates and meetings. It’s important parliament be made up of working mothers so policies and laws that affect families, and in particular working women, are informed by those who experience these challenges.